In 2014, Gail Larsen was besotted by Joseph Campbell’s statement that the Holy Fool is the most dangerous person on earth and the most threatening to all hierarchical institutions. That’s because the Holy Fool has no concern for naysayers, and no one has power over him (or her). S/he is not limited, not stoppable, not controllable. HolyFools follow their own inspired paths to do what needs to be done and do it, no matter what. Their actions make a difference in creating a more just and sustainable world in support of all of life. Inspired by the many Transformational Speakers who exhibit these Holy Fool qualities, Gail declared April 1 a special holiday: Holy Fools Day! We’ve been encouragingHoly Fools ever since by hosting annual online events to bring forth their stories to shine light on the inspired action they are taking. Listen in to our past events below. 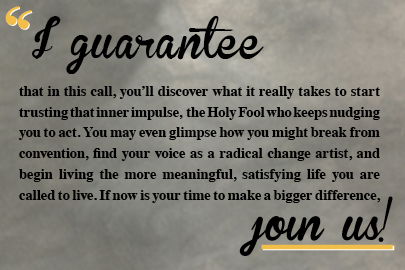 Find your voice, speak your truth, and shake things up with these Transformational Speakers and Wayshowers—Holy Fools, One and All! An introvert who has stepped out in a bold way, Karen is on a mission to bring people and the planet back into a natural rhythm. She wrote the play Birth, seen around the world by over 50,000 people, raised over $500,000 to improve maternity care, and founded BOLD Birth, a global movement training facilitators and galvanizing grassroots communities to change the culture of birth by teaching women to put themselves at the center of their birthing experience. Now she is launching her Bold Tranquility Movement encouraging sleep, deep rest, and the power of yoga nidra meditation to manifest concentration and energy, prerequisites for sustainability in expressing your Holy Fool! A renowned photographic artist, Chris answered the call of his Holy Fool to Midway Atoll, a remote cluster of islands more than 2000 miles from the nearest continent, to photograph a horrific emblem of the collective trance of our consumerism and runaway industrial growth. Here in this “garbage patch of the Pacific,” the ground is littered with the bodies of baby albatross birds who were fed lethal quantities of plastic by their parents who mistake the floating trash for food. Chris asks us to consider: Are we no longer able to discern what is nourishing from what is toxic to our lives and spirits? Who gives up 26 years of banking success and financial security because he peers into the window of an empty storefront and his intuition suggests a path less travelled? A Holy Fool, of course! Charles is the founder of Storm Wisdom: A Center for Intentional Living in Phoenix. This oasis for explorers to search, study and expand their spiritual nature provides tools, practices, and perspectives that bring uplifting and sustainable change. Forced from her family’s organic farm because of encroaching development, Atina and her partner Martin started over on new land, spending years rebuilding soil that had been damaged with chemical farming. Fifteen years and a very successful farm later, she casually opened a letter that had been languishing in her mail, only to learn their new farm was threatened by an oil pipeline owned by the notorious polluters—the Koch brothers. Her Holy Fool was fully ignited when she perused the pipeline company’s plan and came to, MinnCann Pipeline will not knowingly allow more than twelve inches of topsoil erosion. Atina’s masterful book Turn Here, Sweet Corn reads like the best of novels, following this heroine’s journey from the depths of despair to rallying legal and community support to win her case and establish new standards for the protection of organic soil in MN and beyond.